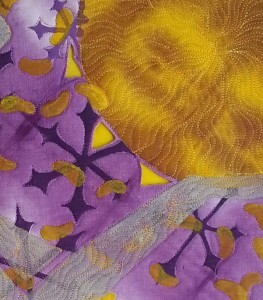 And now let’s turn to the ART of quilting, that is, how to make our chosen quilting design look the way we want it to. I was never trained as an artist. One of the best things I ever did to improve my quilting skills was take a beginning drawing class at a local non-profit, The Drawing Studio. There I learned that one key to drawing what I see is to LOOK at what I am seeing instead of assuming, “I know what a fill-in-the-blank looks like” so I will draw it like so. The drawing class really helped me focus on the looking/analyzing before drawing/quilting. If you have not taken a drawing class, now is the time! What have you done to improve your quilting skills?